New Delhi: A 20-year-old student, suffering from a rare eye disease eye stroke which almost leads to the loss of vision, was successfully cured at Delhi hospital. Ajay Kumar was suffering from Branch Retinal Artery Occlusion (BRAO), which is caused by the obstruction of the central retinal artery. It is a rare disease and seen among one in 50,000 people. Kumar, who started wearing spectacles at the age of 12, had distorted vision and blind spots which his parents ignored. As the situation turned critical and he sought medical attention, Kumar was diagnosed with Branch Retinal Artery Occlusion (BRAO). According to Kamal B. Kapoor, opthalmologist at Sharp Sight for Vision hospital, fluorescein Angiography was performed on Kumar to check the blocked blood vessels in his right eye. “In addition to this, his blood cholesterol level, blood pressure were monitored and Kumar had high cholesterol levels. A very simple treatment of inhaling a carbon dioxide-oxygen mixture was done which helps in dilating the arteries. “A liquid from the eye was removed and observed that few clots moved away from the retina,” said Kapur. 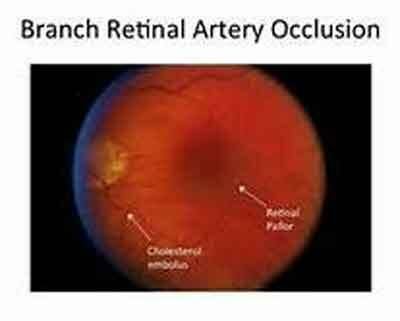 Terming it a rare case in a 20-year-old boy, Kapur said Retinal Artery Occlusion is prominent among those who are usually above 40 years of age. Recent medical surveys stated that BRAO is found in an average age group of 45-55 years. The probability of BRAO affecting the age less than 30 is one in 50,000. Among the problems, BRAO leads to loss of peripheral vision, distorted vision and blind spots. How to administer co2 mixture? I am glad to note that co2+o mixture has helped in removing the clots in retinal artery branch obstruction.